In a large pot, cook macaroni according to package directions. In a separate medium-sized pot, cook butter, onion, salt and pepper, over medium heat, until onion is slightly tender. Blend in flour and reduce heat to low, stirring constantly, until mixture is smooth and bubbly. Add milk and increase temperature to medium-high. Allow mixture to boil, stirring constantly, for 1 minute; mixture will begin to thicken. Remove from heat and stir in cheese. 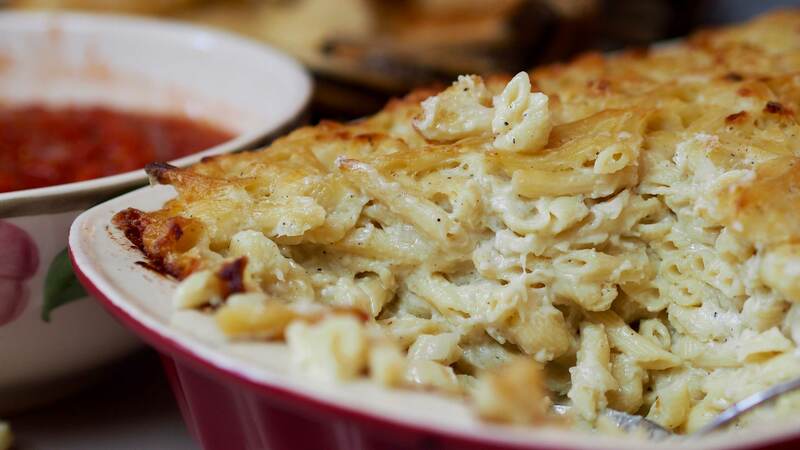 In an ungreased casserole dish, layer macaroni with cheese sauce and stir to combine. Cook, uncovered, for 30 minutes. In a medium pot, add onions and crushed tomatoes. Bring to a quick boil and reduce heat to a simmer. Cover pot with lid, cook for 1-2 hours, stirring occasionally. To serve, plate baked macaroni with stewed tomatoes on top.